Not even gods can change the past, but the world's future is fair game. Lamont Price is afraid. A loner by choice, his life is defined by running—from relationships, from the law, and from his own guilty conscience. Once a boy who dreamed of adventure, he now wishes for nothing more than to slide through life unnoticed. Emma Sutter is also on the run, leaving behind a painful past of abuse and neglect and stepping boldly toward a future of wonder and possibility. Independent and strong-willed, she’s searching for a fresh start and the loving acceptance she hasn’t known since girlhood. When the gods, disguised as mortals in the windswept town of Pantheon, call Lamont and Emma together, neither seems a likely choice for a hero. Destiny, however, does not always work out the way one expects. With the fate of the universe at stake, these two must stand against a Legion of evil, battling their own demons in the process—But first they’ll need to see past themselves and discover the power within their reach. I received a review request from Josh Strnad and what captured my attention after reading the description was the notion of marrying American western with Greek mythology. The story follows two main characters; Emma, a strong, wilful young woman who escapes a life of prostitution and Lamont, a young cowboy on the run from the law. The story evolves quite rapidly as we learn that Emma is chosen by the King of gods for a special task and Lamont is chosen as her protector. Along the way they find aid from certain gods while being thwarted from others. 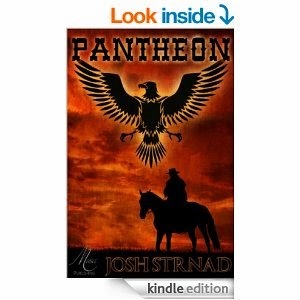 I was curious how the author would be able to combine the wild west with Greek gods, it's definitely an unusual mix, and I thought Josh Strnad did a great job in blending the two ideas seamlessly together. It's a testament to Strnad that it didn't feel odd seeing Hades - god of the underworld - as a gunslinger. Characterisation was done well; both main characters developed over the course of the book, particularly Lamont who started of whiny and self-preserving but steadily grew into his role as protector. The writing did feel stilted at the beginning with the dialogue feeling a little contrived, but as the book progressed, the sentences got sharper and the dialogue more polished. One major problem I had with the book was that I wasn't enraptured by the storyline. It was an OK plot, but just didn't fuel my excitement. Which was a great shame really as I liked the concept of the book and I applaud Josh Strnad for being bold by doing something different in a genre where everyone seems to be churning out the same material. As for editing, no real issues to report. Apart from the rare typo, it was all-in-all a well edited story. While this book may not be in my 'top ten books I've read this year' it certainly wouldn't be in the worst pile. If you're looking for something quirky, something which has the temerity to blend Greek gods and cowboys then I definitely recommend this book. If Josh Strnad continues to be as daring in his future books then I'm sure he'll have a successful future. Thanks for the kind words. Yes, it was somewhat of a strange mix but for me I'm the opposite - I prefer Greek mythology to the wild west.